Seems like all we have done since we got to Kerrville is fill out paperwork and go to doctor’s appointments. We realized that we should have used this time to catch up on blog entries. So here is our review of Timberline Campground in Waukee Iowa. Timberline is easy to find with our gps. The location in Waukee is nice because it is close to relatives in Perry and close to Des Moines for sightseeing and eating. The park roads and sites are gravel. We were in a pull through with fairly convenient hookups and a good line of sight for our roof mounted automatic satellite dish. Here is the Lifestyle from the front. We would stay at this park again, in fact we are trying to figure out when this year we will be back in Iowa. 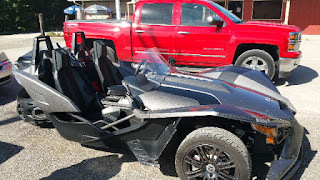 While in Waukee we saw this Batman-like motorcycle.